Cottage - house, intended for recreational purposes. Accommodation is available throughout the building-up 20 people. 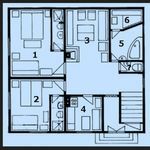 Apartment A: can include max 8 people. 2 x 4 bed rooms with bath. equipment in the rooms: shower, toilet, sink /, fully equipped kitchen, et al. Living room with fireplace, sauna. TV-SAT, radio, internet. 1 x 4 bed room with bathroom. 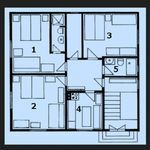 toilet / shower, toilet, sink /, 2x4 bed rooms, bathroom, fully equipped kitchen. TV-SAT, radio, internet. It is also possible to separate accommodation rooms. On the adjacent land is set up for guest parking, sheltered garden furniture with built-in barbecue, garden pond with sitting area + outdoor fireplace, skittles, garden chess, darts, sandpit, swing, volleyball court. The possibility of reductions in the aquapark Tatralandia Bešeňová ski resorts in Jasna and V. Tatras, and selected cultural venues. Bobrovec-village in the beautiful surroundings Liptov. The Lipt. Nicholas towards Aqupark Tatralandia before the end of town - turn right, about 3 km. Reserve your accommodation and BB Privat Bobrovec will directly send the confirmation in 1 workday. Upstairs 3-Room Apartment for 12 Persons "B"
Ground Floor 2-Room Apartment for 8 Persons "A"
The rating of BB Privat Bobrovec is 8.3 from the maximum 10, 2 based on actual and valid guest ratings and reviews. Upon check-in, the guests are required to pay a security deposit of 50 €, which is fully refunded upon check-out in case no damage to the property is done!